Until the other day I had no idea the Mercedes-Benz CLK GTR existed. No idea and yet here it is. WOW! That is some car. There is only one right hand drive Roadster version and it just sold for US$1,018,728. I have to say for the almost the same money as a Veyron I would rather have this. 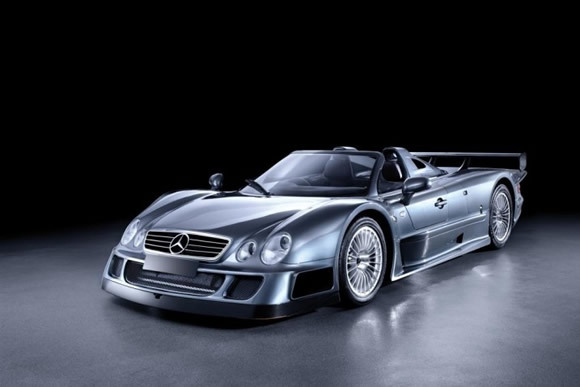 The CLK GTR was designed and built for racing in the FIA GT Championship and later upgraded for Le Mans. As it needed to be homologated for racing 25 cars had to be built. In the end 26 were built. Most of the cars had a 600HP plus 6.0 litre V12 engine and a 6 speed sequential gearbox that without the racing restrictor produced 720HP! Awesome. Five were built with a 7.3L V12 but I couldn't find a horsepower rating. Beautiful, rare car that is very, VERY potent.